The Dallas Mavericks acquired Lamar Odom from the Los Angeles Lakers, which will have ripple effects throughout the NBA as teams try to finalize rosters in this chaotic period following the NBA lockout. Above you see a photo of Odom battling Dirk Nowitzski last year in the NBA playoffs. Instead of working to get revenge for the Lakers, Odom will now be a crucial part of the Dallas effort to return to the NBA finals. This trade signals the end of the bizarre saga surrounding the Chris Paul trade that was rejected by David Stern. That controversial decision has rocked the NBA, and now we’ll be hearing about it over and over again as New Orleans tries to unload Paul to another team. The Lakers decided to back out of the talks rather than submit a new trade from Chris Paul to the league, and in dealing Odom put an abrupt end to that scenario. Meanwhile, the Lakers now seem to be focusing their attention on acquiring Dwight Howard in a deal that would involve Andrew Bynum. As for the Mavericks, this trade for Odom became possible when they decided to work a deal with the New York Knicks when it became clear they would be losing center Tyson Chandler to the Knicks. That gave the Mavs an $11 million trade exception which they then used to acquire Odom. Odom made it clear he didn’t want to leave LA, but the powers that be clearly decided to go in another direction. Dallas has more moves to make as it reworks in roster in the wake of losing Chandler. Chandler was a very important piece of their championship puzzle, but he’s the kind of player that can be replaced. Dallas is now one of the teams that might get a shot at landing Dwight Howard as the Orlando Magic have permitted them along with the Lakers and the New Jersey Nets. There’s also buzz out there that Vince Carter will land in Dallas as well. Carter can still score, but he’s not the kind of player one thinks of to help a championship team. Maybe he’ll be better in a reduced role. The Dwight Howard sweepstakes will be the next big story that will have ripple effects around the league. We’ll see how serious Dallas is in that contest. It’s nice to have a franchise point guard, isn’t it? 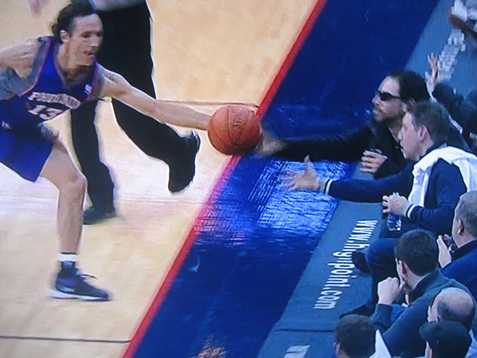 During Monday night’s Suns/Nets game, there was an incident when Steve Nash went to save a ball that was going out of bounds. 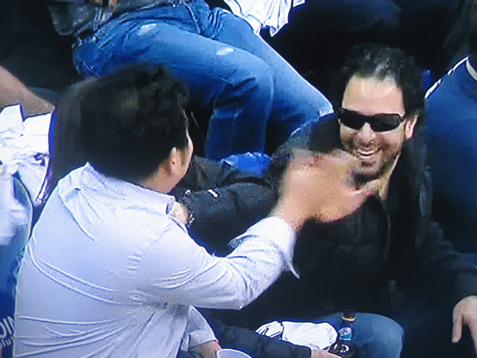 As he attempted to make the save, a fan sitting courtside (wearing sunglasses, no less) reached out and hit the ball away. Here’s a snapshot of the play. Way to hurt your team, buddy.